Previously here at TheXboxHub we had reviewed issues #1 and #2 of the new Tekken series from Titan Comics, but now the first volume TPB collecting issues #1 – #4 is available. The comics bridge the gap between Tekken 6 and Tekken 7, and the ongoing feud between the Mishima family. Once again the TPB starts off with character profiles for each of the fighters that feature in the issues following to give some back story for those unfamiliar with the beat ‘em up franchise. It goes into detail regarding their relationships with the other characters and their individual allegiances. 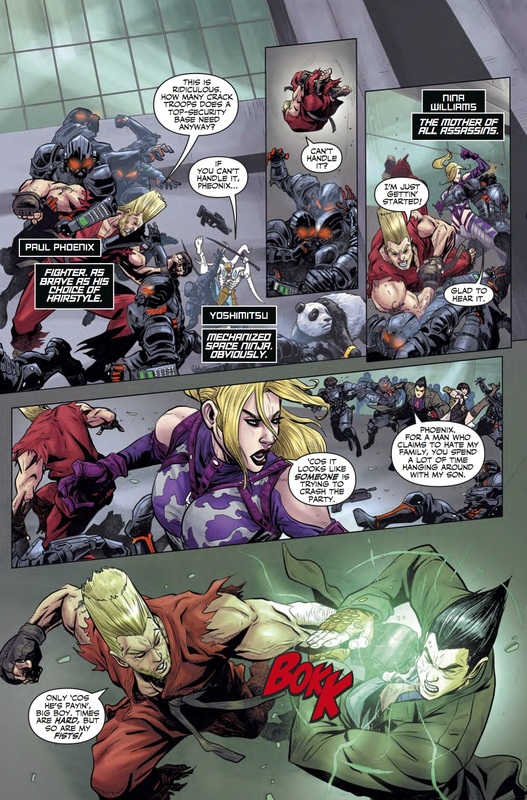 The TPB opens with Nina Williams on the hunt for Ling Xiaoyu, who is also being hunted by the G Corporation because they believe she knows the whereabouts of the current CEO of G Corporation – Kazuya Mishima’s son – Jin Kazama. Jin has been quiet since he discovered the Devil Gene he carries from being passed down generations from his grandfather, Heihachi Mishima, cannot be destroyed. On top of that, Heihachi and his son Kazuya cannot stand each other either, Nina’s sister, Anna Williams, works for Kazuya as his bodyguard and Kazuya’s army consists of a hell of a lot of robotic fighting machines affectionately named Jack. The Tekken backstory contains more suds than Coronation Street and Eastenders combined. 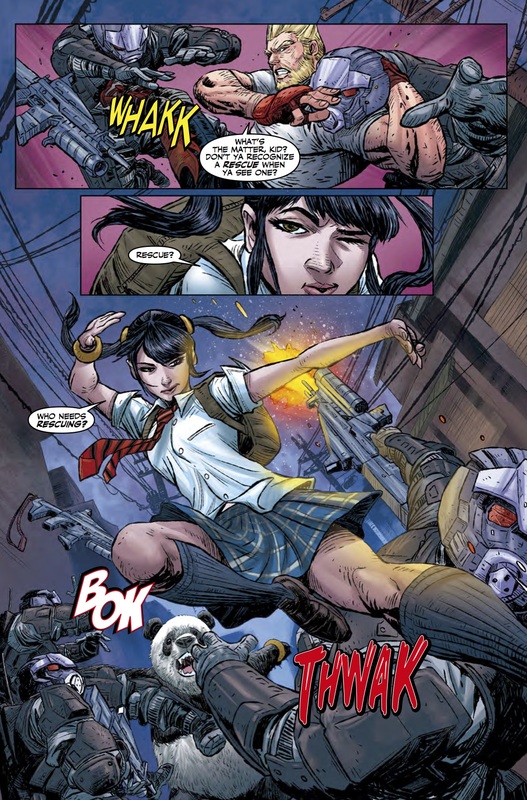 Anyways, Nina – along with Paul Phoenix – manages to rescue Ling Xiaoyu before the members of G Corporation can get hold of her and take her to a temple hidden in the Hida Mountains that they are using as a secret hideout. Here, other members of the Tekken roster, King and Yoshimitsu, have been protecting the man of the hour, Jin himself. Obviously, he doesn’t stay hidden for long and Kazuya comes to crash the reunion. Jin however, has just enough time to tell everyone why he has gathered them: He needs the gang to go into Mishima Zaibatsu Archives – headed up by Heihachi – and retrieve an artefact known only as Artefact 333. The rest of the TPB follows Jin and his crew on a race against the other factions to recover the artefact. Writer Cavan Scott has done an excellent job re-capturing the personalities of the characters in the way they interact with their allies and enemies. 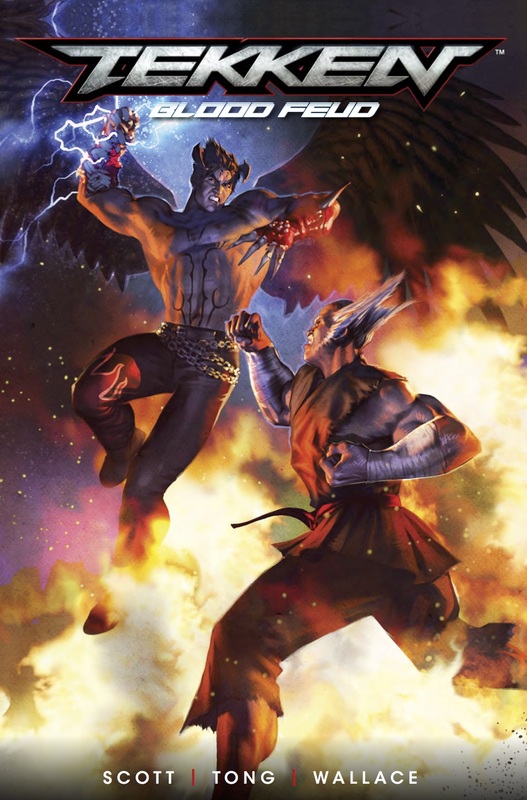 The personal rivalries that have gone on throughout the Tekken games are fully represented too. And the humour that has become such a staple of the games is certainly here. Paul Phoenix in particular is written superbly and acts as the comic relief throughout the pages. His one-liners and quips rub people up the wrong way, but it is great for the reader who is familiar with the character. Sadly, I feel the art lets the rest of it down. This is apparent when each time a character appears, the name and bio appears next to them. Without this, it would be difficult to understand who is who because the models are far from their graphical counterparts. Some pages are spectacular though with great amounts of detail in them. These one-page drawings offer huge amounts of detail in design and storytelling. Without giving too much away there is one in Issue #4 showing characters under the influence of Artefact 333 and it’s easily the best drawing in the TPB. On the whole though, the panel shots are disappointing in comparison. the various covers available for each issue along with the artist that drew them, and a couple of black-and-white character sketches are thrown in for good measure. As the first part of a planned ongoing comic series, Tekken Blood Feud is off to a good start. Its pacing can be a bit slow at times, but with these epic confrontations between characters popping up frequently, this can be forgiven. I really like the writing as it is very much in keeping with the games: humorous and not taking itself seriously. I’m not the biggest fan of the art in the panels though, but the one pieces do look fantastic. It’s a series I will be keeping up with; first and foremost because I am a fan of the series in general, but also because the story is interesting enough to keep me invested.